To busy to eat in the morning? Got picky kids? 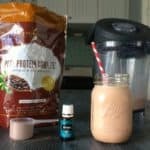 Try this delicious Mint Chocolate Protein Smoothie. It’s just 3 ingredients, so it’s a snap to make and will set you up for the day! It’s 7:30 am, and it’s time to go to school or work… like 10 minutes ago! I feel like these are most mornings for me. Historically, I haven’t been morning person, but essential oils have helped me to wake up feeling more refreshed and ready to start the day. But still, I’m usually a late starter in the morning, which means I’m rushing the kids off to school. So we often eat on the go – but the challenge is giving my kids a meal that will give them the protein they need to start the day. I’ve got three kids – and two of them are always challenging my food options of pasture-raised eggs or bacon. They usually opt for gluten-free cereal or oatmeal. Ugh! What a headache. It’s not even 8 am yet, and we’re debating over food. Can you relate? Do you have kids who are picky eaters? Or do you every feel rushed in the morning? I’ve got the perfect solution! 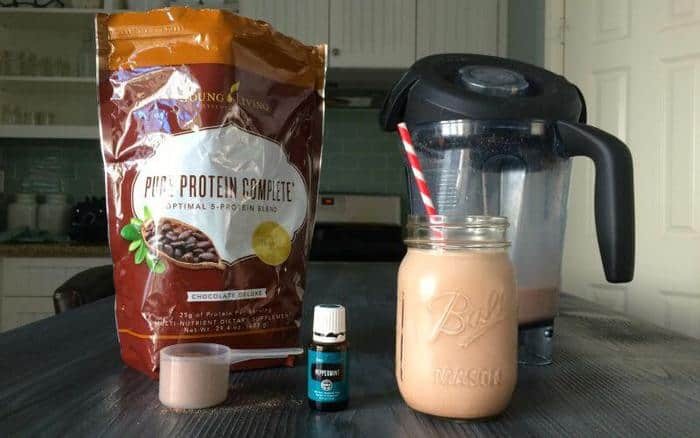 This Mint Chocolate Protein Smoothie recipe is simply delicious, yet it’s loaded with a comprehensive protein supplement, full range of amino acids (including glutamine), B-vitamin blend and enzymes to help support healthy digestion. 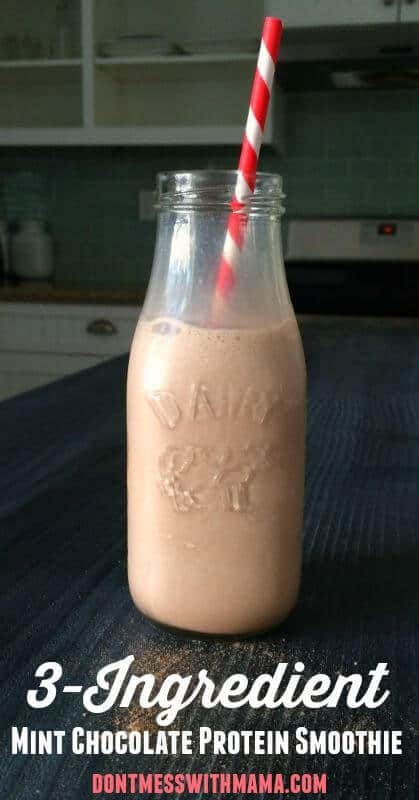 Yep, it’s a full meal in a drink – and it’s so yummy the kids will forget all about regular chocolate milk. This recipe is just 3 ingredients – okay, 4 ingredients if you count the ice. Just combine all of them into a blender (Vitamix is my favorite) and voila! The bestMint Chocolate Protein Smoothie you’ll ever taste. You can even omit the Peppermint to have a Chocolate Protein Smoothie that’s nothing but plain. It’s filling, rich and smooth – not grainy like other protein supplements. So what sets this one apart? Pure Protein Complete – Chocolate Deluxe. Seriously, I’ve never had anything like it. My kids and I were licking every drop from the blender. 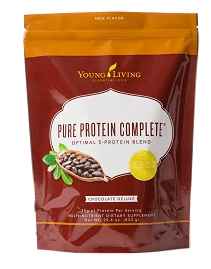 Pure Protein Complete – Chocolate Deluxe is available from Young Living (where to buy wholesale). I like to add Peppermint essential oil (literally 1-2 drops) to give this smoothie a minty flavor that tastes like a Peppermint Patty in a shake, plus Peppermint is great for supporting healthy digestion. You could omit the Peppermint for a healthy chocolate smoothie too. Did you try this mint chocolate protein smoothie – Tex Mex pumpkin seeds? Don’t forget to rate the recipe and comment below to let me know how it went. You can also FOLLOW ME on Facebook, Instagram and Pinterest to see what other fun things I’m getting up to. To busy to eat in the morning? Got picky kids? Try this delicious Mint Chocolate Protein Smoothie. It's just 3 ingredients, so it's a snap to make. 1 cup milk raw cow's milk, organic coconut milk, organic rice milk, etc. 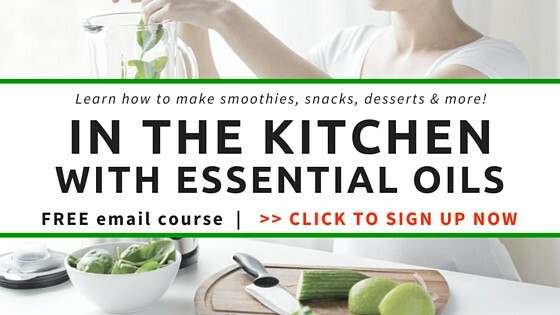 Add all ingredients to a blender and turn to medium or high speed. Keep blending until ice is crushed and smoothie has a frappe consistency. Love the idea of adding coconut milk to this, so delicious!